Mark Selby beat world number one Neil Robertson 17-15 to set up a World Championship final against defending champion Ronnie O'Sullivan. 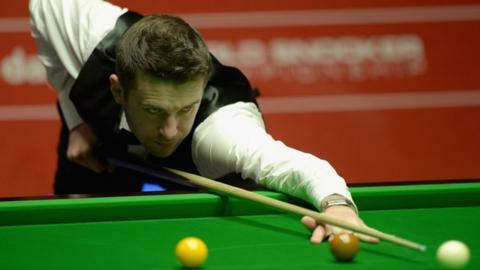 World number two Selby triumphed in a marathon semi-final at the Crucible that lasted more than 12 hours. "I'd be lying if I said I wasn't feeling tired," said the 30-year-old. "Ronnie's a genius and doesn't fear anyone. I know I'll get my chances, but it's a matter of whether I take them or not. O'Sullivan has won each of his previous five finals, while Selby, 30, lost on his only appearance, against John Higgins in 2007. Selby, from Leicester, added: "I'm sure I won't sleep because of all the adrenaline but I'm going to go out there in the final and enjoy it." Selby and Australian Robertson started the final session on Saturday tied at 12-12. Robertson, 32, won the first frame before Selby took four of the next five, thanks to breaks of 79, 77 and 54, to move within one of victory. Robertson, who earlier in the tournament became the first player to make 100 century breaks in a season, reduced the deficit with a contribution of 108. But Selby took advantage of a poor Robertson safety shot to seal victory with a 74 break.